One of the ingredients that Srivalli mentioned in the BM #54 announcement was Cauliflower.So this was the dish I wanted to post. roti.This is my post for BM 54, Week 4, Day 2. Heat oil in a pan and add cumin seeds. When it crackles, add onion, ginger, garlic, onion, curry leaves,green chilies and saute.Whent he onion turns translucent add turmeric powder, potato and cauliflower, peas. 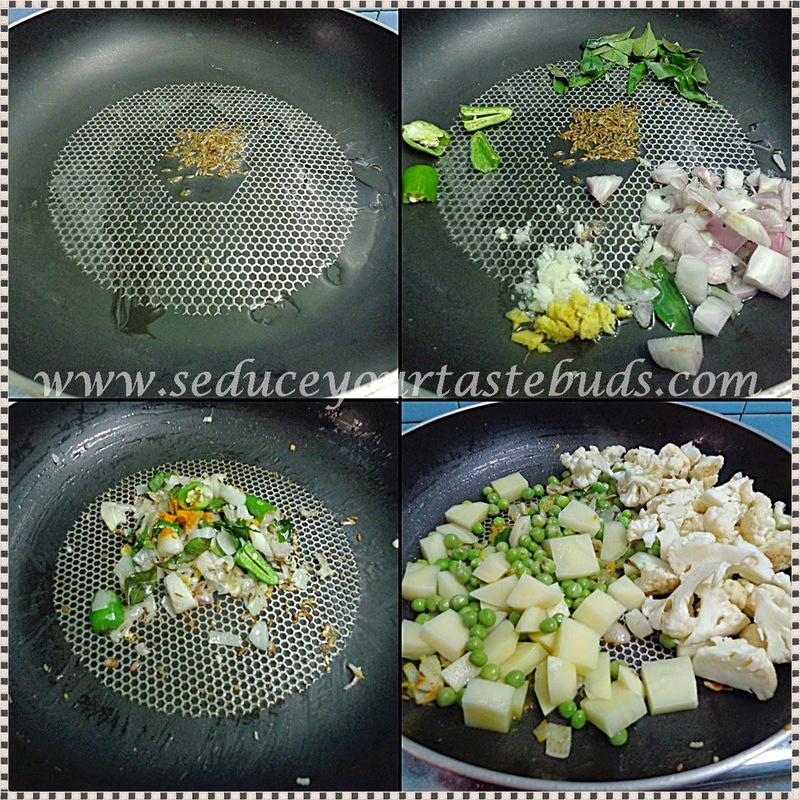 Mix well and saute for a few minutes and add 1/2 cup water and salt, mix and cover and cook till the vegetables are just done but not mushy.Open the lid and mix in between a couple of times so that you can check the vegetables and also prevent them from sticking to the pan. Add a little more water to cook if needed. Add tomato. chili powder, coriander powder, garam masala and cook on low flame for a few minutes till the tomato turns mushy.Remove from heat and serve as a side with steamed rice..
oh that last click is killing!!! so drool worthy!! Its a simple, yet delicious side for rotis, rt? Simple and delicious recipe.. Nice clicks. Such a colorful and yummy looking curry. Looks absolutely delicious, perfect Aaloo Gobhi, just how I like them. I love aloo gobhi.Looks yummy. 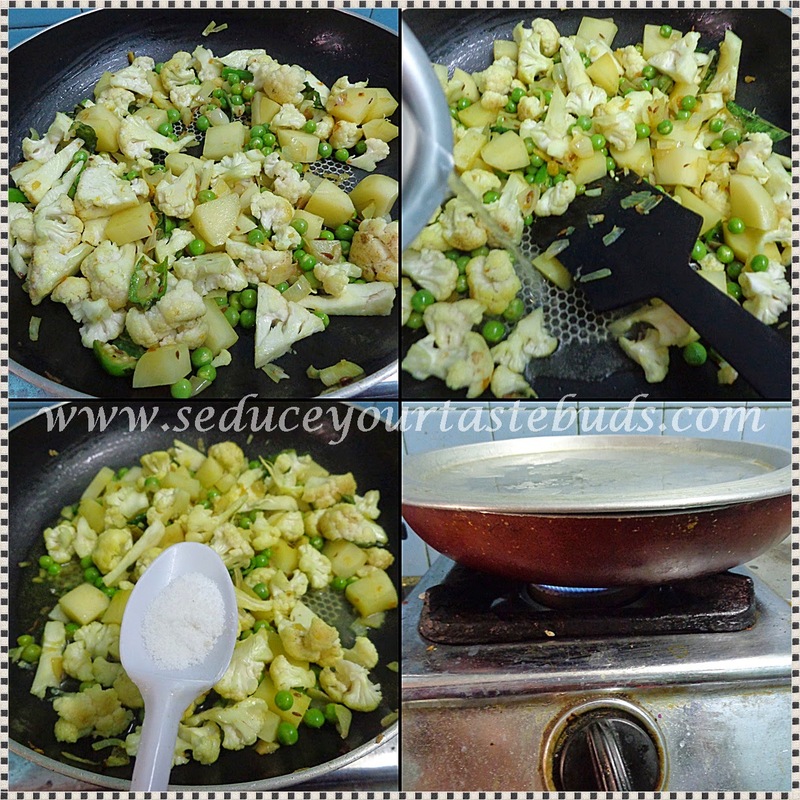 Nice dish of aloo gobhi whith all steps photo. 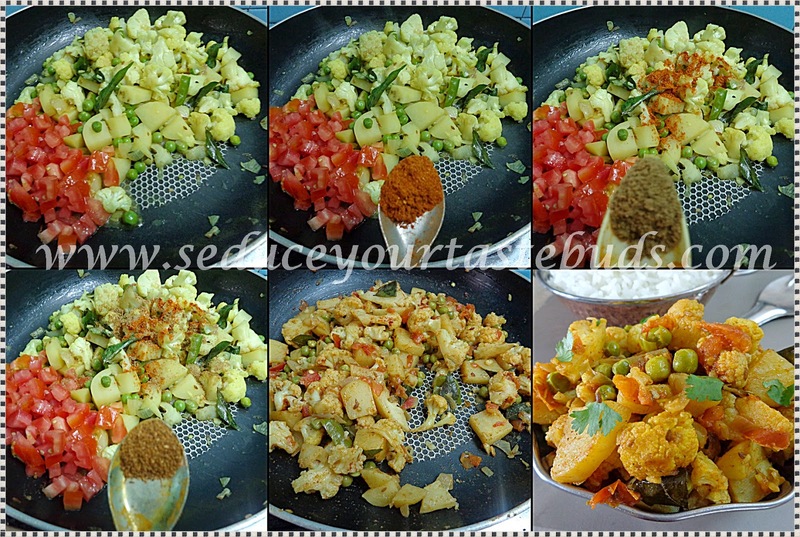 very inviting aloo gobi masala..yummlicious.. I love such side dishes..so nicely done PJ.. Simple and healthy. A tasty side that can be made on busy weekdays too. Very nice.